Home News The New NEM for Residential, Commercial & Industrial. 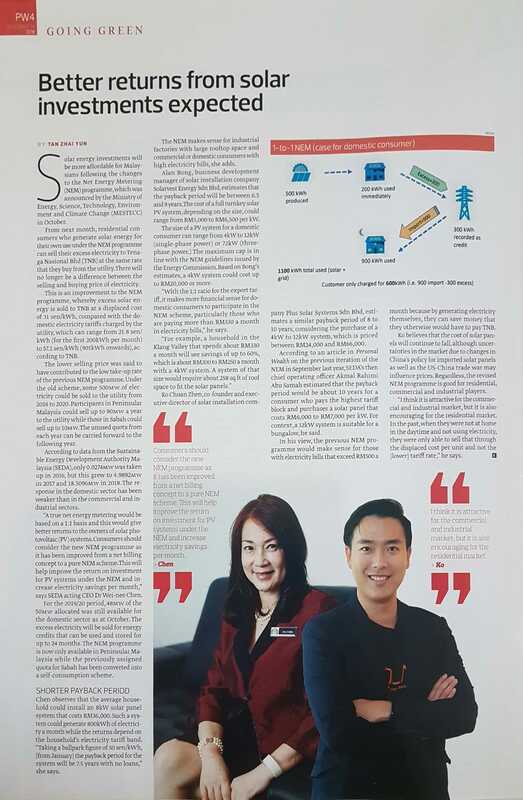 It is our pleasure to be interviewed by The Edge Malaysia to share our industrial insights together with Dr Wei-Nee Chen, the Acting CEO of Sustainable Energy Development Authority – SEDA Malaysia. “A true NEM would based on 1 to 1 basis and this would give a better return to the owner of solar photovoltaic (PV) systems. Consumers should consider the new NEM programme as it has been improved from a net billing concept to a pure NEM scheme This will increase electricity savings per month”, says Dr Chen. Interested to explore a custom-made solutions for your commercial and industrial building? Send us an enquiry email now at web@plus-solar.com.my or give us a call at 03-8994 2890. We are ready to provide you a FREE Consultation and Site Survey.